As the holiday season is about to begin and many work from home eCommerce business owners are preparing for Black Friday (Black Friday searches began rising at the beginning of the week already), maybe there is another more important day to prepare for in terms of online spending- Cyber Monday. Cyber Monday is the first Monday after Thanksgiving weekend, which occurs few days from now on November 28th. It is characterized by increased online shopping consumer behavior and for many eCommerce businesses it is the most profitable day of the year! The assumption is that on Cyber Monday people are continuing their shopping momentum from the weekend, this time online at work or even at home. According to this comScore blog post, online consumers spending on Cyber Monday have increased drastically in the last few years between 2005 and 2010, where in the last three years Cyber Monday was among the top three highest spending days of the whole year! 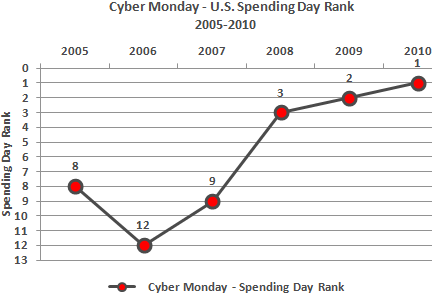 We can see in the chart above that between 2005-2007, Cyber Monday was not among the top spending days of the year, but in 2008 it boosted and became the third highest spending day, in 2009 it advanced to the second place and in 2010 it held the premier. 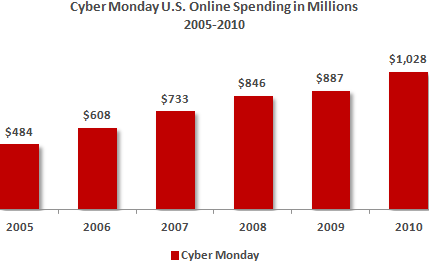 The spending rise in Cyber Monday reflects even better if we look at the actual spending numbers. Between 2005-2010, online spending in Cyber Monday have increased from $484 million to more than $1.02 billion, representing about 212% growth rate! Even between 2008-2009 (when the financial crisis was at its peak), online spending on Cyber Monday have increased by close to 5%, where between 2009-2010 it went back to double digits growth rate of nearly 16%. In the post, the incredible spending growth on Cyber Monday is explained by more online deals and discounts, shorter period of time between Thanksgiving-Christmas and wider media coverage of Cyber Monday. Additionally to these reasons, I think that the natural growth of the web and the increased exposure it receives contributed a major part. Nielsen has measured the online shopping buzz in the social media between 2009-2010 and although it identified much more shopping buzz on Black Friday, Cyber Monday is showing higher yearly growth. Both days have shown significant buzz increase in 2010 compared to 2009. The number of sales mentions in the social media in 2010 Black Friday has increased by 25% compared to 2009, healthy strong growth. The number of sales mentions in the social media in 2010 Cyber Monday has increased by 75% compared to 2009, definitely an amazing jump. The holiday season has become gradually over the past years to one of most the busiest and profitable times for eCommerce businesses throughout the year. Even though Black Friday is the main shopping day, for online businesses Cyber Monday could be a much better day as consumers spends more money on the web.